Playing in a corporate golf league can be a very rewarding experience. Setting one up, however, can be challenging. This article is meant to walk you through the steps of setting up a corporate golf league. The first step is to determine the level of interest that exists. You don’t want to invest the time and energy required to get a corporate golf league rolling before you are sure that there is sufficient interest to sustain a golf league. That being said once started, corporate golf leagues tend to take on a life of there own. They gain momentum from year to year due to the many benefits that they bring to a company and its employees (e.g., increased communication and trust at work). There are several factors you should consider when deciding which course or courses that your corporate golf league will use. location, location, location – make sure that the course or courses that you select are well located and are relatively close to work. cost – depending on who and how many co-workers you want to ultimately take part in your golf league, you will want to use that as a factor in picking the course or courses that you pick. Golf can be expensive especially if you play on a regular basis and you don’t want to limit the success of your golf league by choosing a course that is prohibitively expensive. availability – you will need to call around to make sure that any courses you are interested in have time slots that are open that your golf league can reserve. policies – do they require an upfront payment or deposit. What is their cancellation policy. What is their refund policy. Do they require payment in full for all tee times. As for picking a time to play, it is best to try and determine this when gauging interest above. Find out when most people are available and when most people would be able to make it to a course. Make sure to reserve a day and time early enough so that you are not locked out for the season. There are easier ways to handle the administration of a golf league – use an online golf league administration tool such as http://www.netgolfleague.com. This can be a tedious process if you let it. Try to keep it simple to begin with. You can always inquire from other leagues as to the types of policies they use for such things as refunds, greens fees/fee payments, substitute policy, etc. It is important to make sure that everyone is on the same page and understands or has easy access to league rules from the beginning to decrease the possibility for conflict in the future. Setting the ground rules also means deciding on how handicap calculation and utilization, individual and team scoring methods, and no show rules, among other things. Coming up with the ground rules for your golf league gives you the perfect opportunity to get members involved and invested which will make them more eager to see the league succeed. The key to kick starting a corporate golf league and maintaining momentum is communication and involvement. You need to responsive to questions and prepared to provide members with quick and accurate information about the league, including individual/team standings, rules and upcoming events. Again, this can be made much easier by using an online solution to manage you golf league. Online golf league management give members instant, 24/7 access and, in turn, gratification. This can only be good when it comes to the health of the league. The most important thing is to keep it fun, something people are looking forward to all week. What the heck is MOI and how can a square-headed driver get you more of it? MOI stands for moment of inertia. Something could be characterized as inert if it is resistant to movement and motion. The moment of inertia refers, more specifically, to the resistance of an object to movement around its axis of rotation. The higher the MOI, the more resistant an object is to movement. How is this relevant for golfers? It is relevant because the main objective of golfing is to use various types of clubs to strike a golf ball and make it travel in a desired direction. The way a golf club reacts when it strikes that golf ball can affect the distance, trajectory and direction it takes. The MOI might not matter as much when you hit the ball square with the center of the clubface, but it can make a considerable difference if the ball is struck off-center. Since a club with a higher MOI does a better job of resisting the natural tendency of the clubhead to twist on an off-center hit, the distance and accuracy of the ball’s path is less affected. This is especially the case for drivers, where a minor change in the direction that a ball is traveling can greatly affect a ball’s final resting point, since drivers are designed to cover the greatest distances. As a consequence, a higher MOI = greater forgiveness when a ball is mis-hit. How can club design affect its MOI? The way in which a clubhead is designed directly affects its MOI and its corresponding forgiveness factor. One early trend that major golf manufacturers incorporated into their drivers was to increase the size of the clubhead face. This lead to a bigger sweet spot and some distribution of weight away from the center of the clubhead which affects the center of gravity and leads to a higher MOI. A more recent trend has been to move away from the traditional shape of a driver’s clubhead toward a square design which moves more weight toward the perimeter of the clubhead giving it a boosted MOI. Nike was the first major manufacturer to put a square driver on the market with its Sasquatch Sumo2. 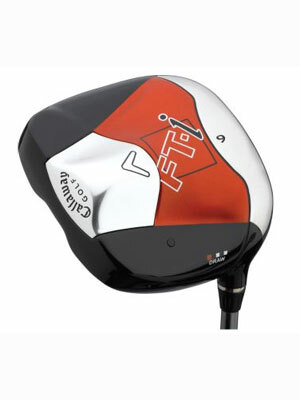 Calloway has followed with its new FT-I drivers that sport the same square design. Given the excitement generated over these new style drivers, you can be sure that other manufacturers will soon follow with square-headed drivers of their own.